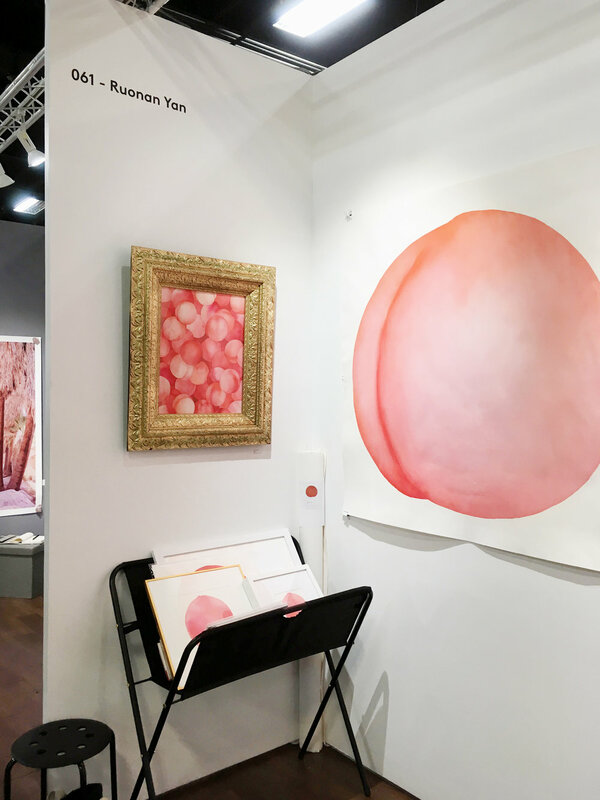 Ruonan Yan’s large peach painting will be participated in the Paddle8 Online Storefront curated by New York Academy of Art. Ruonan Yan is invited to participat in 0-0 LA ’s NYC traveling series of group shows at The Hole gallery. Yan created a group of new works for this exhibition. One of Ruonan Yan’s peach series will be exhibited in Dacia' gallery’s group exhibition ” Women Artists Group Exhibition”. Opening Reception: Thursday, February 21, from 6-9pm. 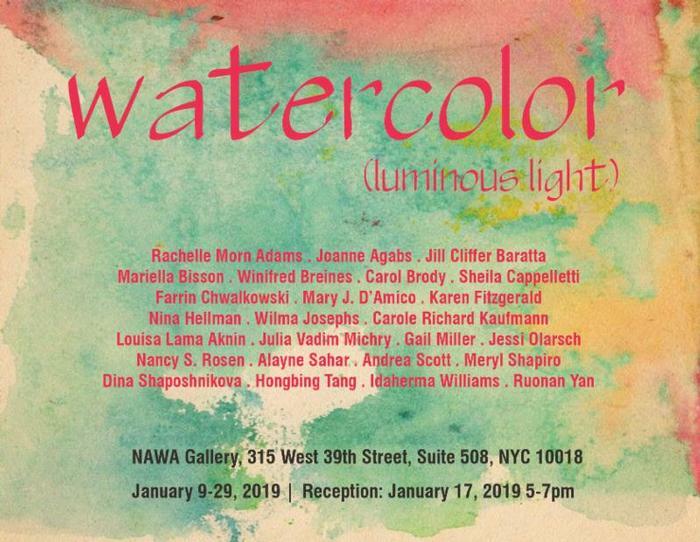 Artists: Liv Sage, Erin Fitzpatrick, Juliette Vaissiere, Ruonan Yan, Yana Beylinson, Lisa Rickard, Julie Severino, Radha Howard, Buket Savci, Kellie Pereira, Kellie Pereira, Mia Berg, Emily Hirtle, Sylvia Nitti, Aki Kano, Alaina Plowdrey, Theodora Capat, Ninni Heldt, Annamarie Trombetta, Michele Riche, Allison Kroll, Aneka Ingold, Maggie Parson and Ellen Maidman-Tanner. 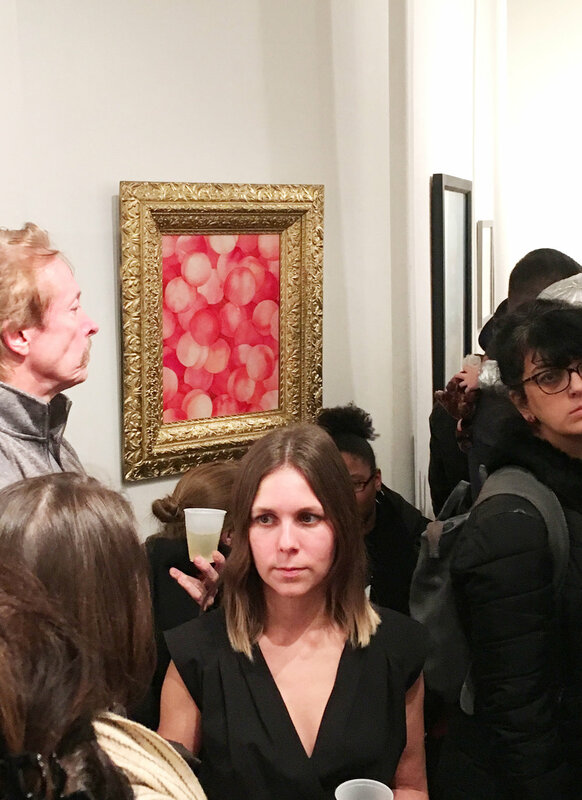 Dacia Gallery: is a contemporary art gallery presenting museum quality solo and group exhibitions of established and emerging artists in the Lower East Side of Manhattan. 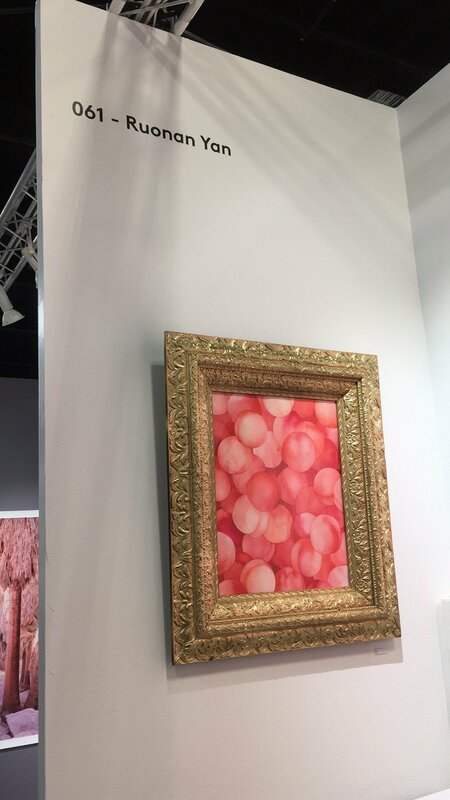 Since 2010, Dacia has gained extensive attention amongst collectors and art connoisseurs by mounting increasingly ambitious representational, landscape and abstract exhibitions, which have included notable artists: Noah Buchanan, Erin Anderson, Janet A. Cook, Max Ginsburg, Travis Little, Daniel Maidman, Christopher Pugliese and Patricia Watwood. Dacia’s success is a result of a fresh and unconventional approach as to what a gallery should encompass, and by partnering with artists to build a strong community of like-minded individuals willing to support and promote each other's achievements. Ruonan Yan is very happy that her work “Pig Feet” is featured in the Delaware Contemporary Chinese new year pop exhibition “China Pop”. Ruonan is glad to be featured on Average Art, an UK-based art magazine. 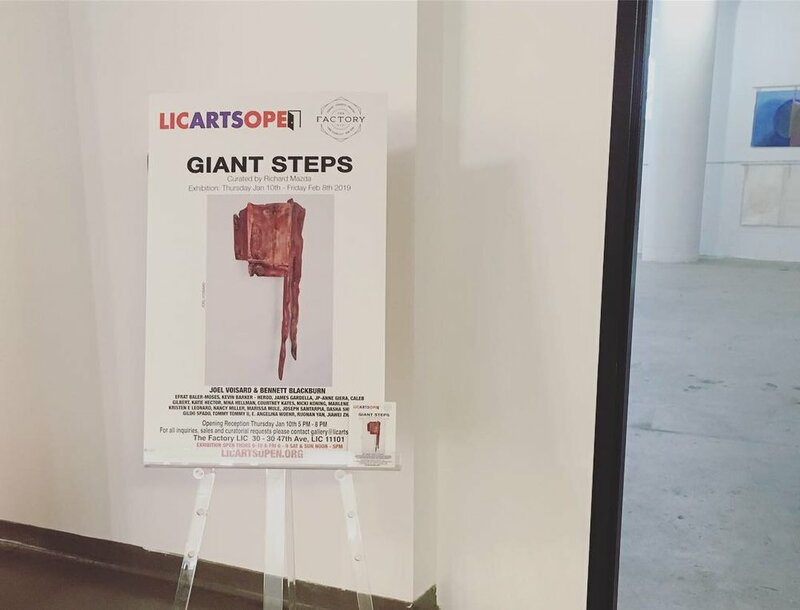 Ruonan’s woodcut prints “Peeled Orange” and “Cashew” are showing in the group show “Giant Steps” at LIC Arts Open Gallery. The exhibition features a collection of large scale multi-disciplinary works including painting, drawing, print, sculpture and video from the collections of Joel Voisard alongside Bennett Blackburn’s The Beasties. 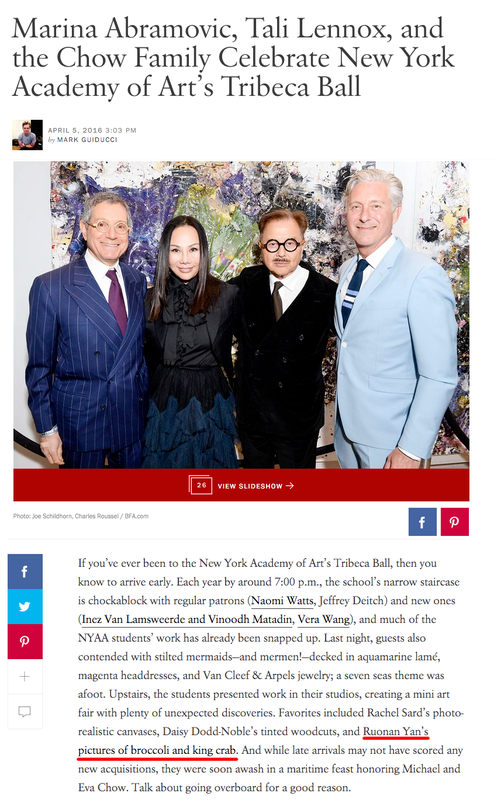 Thanks to curator Richard Mazda for this opportunity. Ruonan Yan is honored to be selected in The Other Art Fair this year from Nov 8th - 11th. Presented by Saatchi Art, The Other Art Fair showcases talented independent artists, each hand picked among 800 submissions by a committee of art world experts. I’m very excited to announce that I will participate the NARS Foundation 2018 Open Studio. Come to see my new works in person! 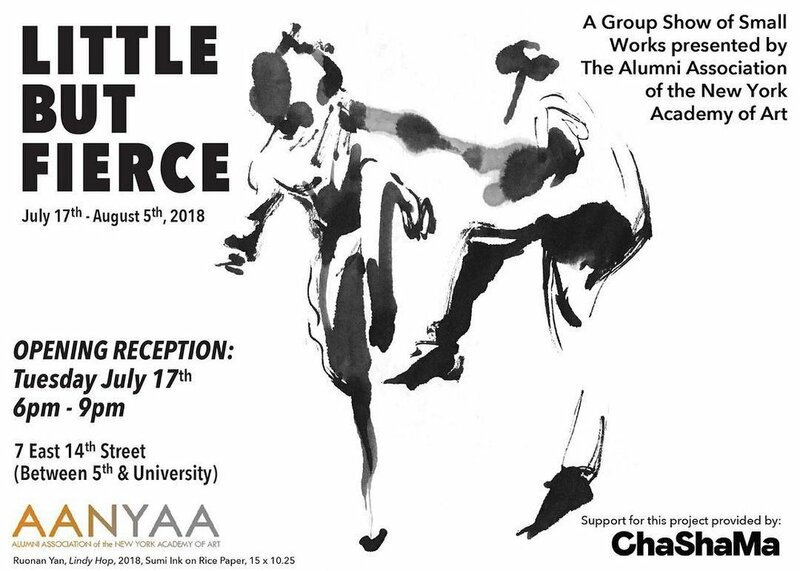 Little But Fierce is a group exhibition thoroughly investigates ferocity and the myriad ways it can be demonstrated in art. Some artists tackle difficult subjects head on, including environmental issues, gender expression, and the body, while others display their ferocity with more formal choices: high key colors, aggressive impasto, and a diverse range of artistic styles. Little But Fierce challenges viewers’ expectation that small art has a small impact, and each small work shines as a gem in this treasure of a show. Ruonan Yan is very excited to announce her first solo show in New York. The greatest humor is never straightforward, but straightforward can be funny. Yan’s huge woodcut prints convey a very subtle unseriousness. The one, and sole object is presented on paper in a deadpan way. 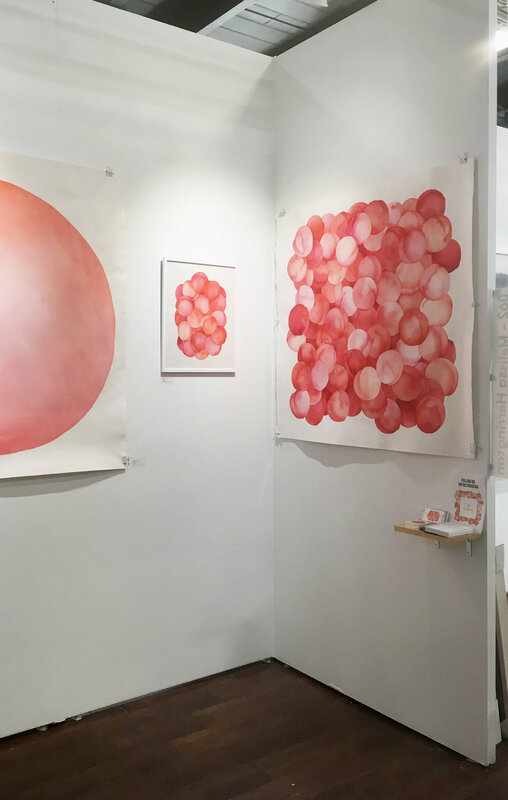 Artist chooses, and focuses on odd subjects like peeled orange or cashew, and magnifies the unimportance of these objects. The theme of food is a common first impression people have from Yan’s work. However, what’s more accurate is, Ruonan is expressing the ridiculousness that comes from ordinariness, or even rationality. Ruonan Yan was interview by Art China. “Happy Chinese New Year: Fantastic Art China” is organized by Ministry of Culture of the People’s Republic of China and undertaken by China Central Academy of Fine Arts (CAFA) , the most prestigious and renowned art academy in China, with US-China Cultural Institute. This is a grand international public art project that employs contemporary arts as its major medium to promote Chinese traditional culture. Joined by the preeminent artists and art institutes from both inside and outside of China. The exhibited works are selected carefully out of a great deal of entries. Ruonan Yan's woodcut print "Pig feet" is now on view in Flux Factory, Long Island City for the NYAA alumni exhibition "Picturing the unprintable". This year, SGCI is hold in beautiful Portland, OR. Ruonan Yan's printmaking works are included as a part of New York Academy of Art's exhibit. ELLE France just posted the winner posters of 2012 poster for tomorrow competition. As one of the top ten posters, Ruonan Yan's poster "Stop Ignoring" is showed to all ELLE France views.